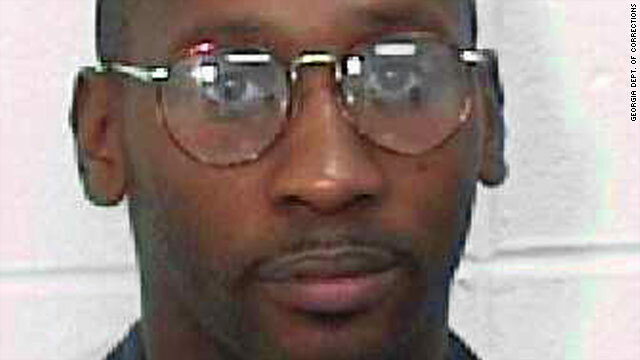 The Georgia Board of Pardons and Parole has denied clemency for death-row inmate Troy Davis. Davis was convicted of the 1989 killing of Savannah, Georgia, police officer Mark MacPhail. Davis is scheduled to be executed by lethal injection at 7 p.m. Wednesday at a state prison in Jackson, Georgia. "Monday September 19, 2011, the State Board of Pardons and Paroles met to consider a clemency request from attorneys representing condemned inmate Troy Anthony Davis. After considering the request, the Board has voted to deny clemency," the board said in a statement Tuesday morning. The five-member parole board votes in a secret ballot. Davis has gained international support for his long-standing claim that he did not kill MacPhail. International figures including Pope Benedict XVI, Desmond Tutu, and former President Jimmy Carter, entertainers such as Susan Sarandon, Harry Belafonte, and the Indigo Girls, and others have joined with Amnesty International, the NAACP and other groups in supporting Davis' efforts to be exonerated. He has been scheduled to die three times before, most recently in October 2008, when the U.S. Supreme Court granted a stay two hours before he was to be executed. Since Davis' conviction in 1991, seven of the nine witnesses against him have recanted or contradicted their testimony. There also have been questions about the physical evidence - and, according to some, the lack thereof - linking Davis to the killing. Amnesty International reacted angrily to the clemency denial on Tuesday. "It is unconscionable that the Georgia Board of Pardons and Paroles has denied relief to Troy Davis. Allowing a man to be sent to death under an enormous cloud of doubt about his guilt is an outrageous affront to justice," Amnesty International said in a statement Tuesday. "Should Troy Davis be executed, Georgia may well have executed an innocent man and in so doing discredited the justice system," the statement said. But the victim's mother, Anne MacPhail, said she's satisfied that Davis will be executed. "Well, justice is done, that's the way we look at it. That's what we wanted," the mother told CNN. "I am very convinced that he is guilty." She said she would not attend Davis' execution but family members would be there. Anne MacPhail said she has not forgiven the convicted of killing her son. "Not yet, maybe sometime," she said. The NAACP and Georgians for Alternatives to the Death Penalty had joined Amnesty International in organizing support for Davis, setting up about 300 rallies, vigils and events worldwide in the past week or so. In addition, they said that more than 1 million people have signed a petition in support of Davis' bid to be exonerated. In a 2008 statement, then-Chatham County District Attorney Spencer Lawton described how Davis was at a pool party in Savannah when he shot another man, Michael Cooper, wounding him in the face. Davis was then driven to a nearby convenience store, where he pistol-whipped a homeless man, Larry Young, who'd just bought a beer. Soon thereafter, prosecutors said, MacPhail - who was working in uniform, off-duty, at a nearby bus station and restaurant - arrived. It was then, the jury determined, that Davis shot the officer three times, including once in the face as he stood over him. Davis' lawyers, in a federal court filing, insisted that there is "no physical evidence linking" Davis to MacPhail's murder. They point, too, to "the unremarkable conclusion" of a ballistics expert who testified that he could not find definitively that the bullets that wounded Cooper and killed MacPhail were the same. Georgia's attorney general, in an online statement, claimed that the expert said the bullets came from the same gun type and noted that casings at the pool party shooting matched - thus came from the same firearm as - those found at MacPhail's murder scene. Two decades ago, a jury convicted Davis on two counts of aggravated assault and one each of possessing a firearm during a crime, obstructing a law enforcement officer and murder. The latter charge led, soon thereafter, to his death sentence. While reviewing Davis' claims of innocence last year, the U.S. District Court for the Southern District of Georgia found that Davis "vastly overstates the value of his evidence of innocence." "Some of the evidence is not credible and would be disregarded by a reasonable juror," Judge William T. Moore wrote in a 172-page opinion. "Other evidence that Mr. Davis brought forward is too general to provide anything more than smoke and mirrors." The parole board denied had denied Davis clemency once before. The board has never changed its mind on any case in the past 33 years. How do you know?!? Were you there? Did you take the forensic evidence?!? NO!!!!! I wish people would stop judging books by their cover.....It's so sad. Here we go. There is soooo much HATRED!!!! Let's REALLY look at all the evidence. They NEVER found a gun. Let's take that into consideration. Technology today was not like it was back then so the cops can't say it was from the same gun if the gun was never found. All they had to go on was eye witness who were probably beaten and tortured to say that Troy did it because of an early incident. Come on people. Are you blind?!? This is exactly why it's called the DIRTY SOUTH. Just plan dirt happen all over. Hell for all anyone knows is the homeless man could have done it or sniper. For all those that have PURE hatred.....my God have mercy on you. he's got Sad little Puppy Dog EYES That just make you want to Lock him up Forever & Ever. Do you all understand that Mr. Troy Davis himself pled GUILTY to the charge?" I've read that he pled Not Guilty to this charge (he pled guilty to an earlier charge). Where did you get that information? There should be no death penalty, only life without possibility of parole. There have been too many innocent people put to death and later found to be innocent. The people that commit the execution are killers same as the people they claim are guilty. God is the only one that can take a life. The drivers license info including photos addresses, phone #'s and credit report and other info will be posted on the web in case anyone wants to have a "conversation" with the pardon and parole board members in the neanderthal state of Georgia. Not by me but by a notorious hacker group. Amen to that. Thou shall not kill. I am very distgusted and deeply saddened by this. And so outraged. There is so much I want to say that I can't even post it. SHAME ON THE U.S.SUPREME COURT!!!! Troy Davis is yet another INNOCENT life lost to our system. How dare the State or any State or anybody for that matter say it is not okay to commit a murder when in fact THEY THEMSELVES ARE DOING THE EXACT SAME THING: MURDER (AND OF AN INNOCENT MAN)! I could go on and on. Rest in Peace Troy. God loves you and we will fight for your justice as well as all wrongfully executed. Peace be with you and your grieving family. THE DEATH PENALTY IS SO VERY WRONG AND SHOULD BE DONE AWAY WITH!! If he is innocent or guilty I do no support death penalty because after all its murder too. However, being that there was no sound evidence for killing this man I think that's poor service on behalf of our judicial system. They basically in actions stated, WE'RE TOO LAZY TO FIND THE REAL KILLER AND ITS BEEN TOO LONG AGO SO SINCE WE ALREADY HAVE A MAN LET'S KILL HIM INSTEAD....but he said that he is right with God so he will be going to a better place than anyone on Earth could ever fathom. On another note, IT IS 2011 ANYONE STILL STUCK ON RACE OR GENDER IS A FOOL!!! Love is what will change this country not hate. WHERE the innocent man at that you talking about? It sure as hell isn't this Troy Davis !!! Why didnt Obama grant him clemency? or pardon him? Clinton pardoned a federal death row inmate ..for a matter of fact he pardoned 140 people lol what happened here why wasnt Obama in on this? You answered your own question. Clinton intervened in a FEDERAL CASE, the Troy Davis case was a STATE CASE. Obama couldn't have intervened, even if he wanted to. you know it really would not have matter if it was a federal or state case..
stop other counties from doing wrong. he could have stopped his own people.. but it is water under the bridge and to them we lost a good person that was murdered by the American governor.. WOW!! makes you wonder! Family members will be attending the execution? Even if they are going to execute this man (which is totally wrong, as all executions are) surely it is only right to grant him a dignified and private death. Besides this, punishment should never be used to award some kind of sick, morbid entertainment to the victims of the crime, but only to deter future potential criminals, to prevent the criminal from re-offending and to rehabilitate (though that obviously doesn't apply to executions). Refusing to forgive a criminal who has caused you harm is one thing, but actually attending their execution is on a completely different level and, in my view, not acceptable behaviour.